Tossed with mixed greens and tomatoes, and drizzled with a blend of ranch dressing and BBQ sauce, this chicken salad looks as wonderful as it tastes. 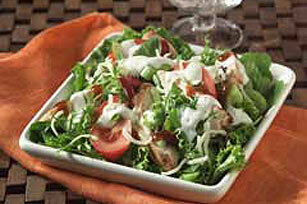 Toss salad greens with chicken and vegetables in large bowl. Add dressing and barbecue sauce; mix lightly. Substitute 1 lb. grilled boneless skinless chicken breasts, cut into bite-size pieces, for the OSCAR MAYER Deli Fresh Grilled Chicken Breast Strips.